We ship our safes Australia wide! We stand behind these products as we feel they are the best on market for the level of security they offer. If you buy one of our selected safes listed below and it is broken into (breached ie the criminals gain entry) or rendered unrepairable we will replace it with a safe of the same size and quality! Replacement of safe where safe is stolen is only available when a bolt down/ Installation is performed by KGB. We are offering this because we have such faith in the above safes and are happy to answer any questions you may have. I had rung a number of companies throughout Brisbane regarding some work I required in a timely fashion. The companies I had rung days before I spoke to Sharon at KGB Security were yet to respond to my messages and inquiries. I called KGB Security and spoke immediately to Sharon regarding the work I needed, she stated she would call me back; in my mind I was thinking, here we go again. Within ten minutes Sharon had called back with a quote, and being happy with the price, I asked about the timeline, thinking, maybe some time next week. I did explain that without the work I required being completed, I would be unable to perform my role. Sharon, was able to organise the tradesman for a few hours later that day. Sure enough, five minutes before that set time, Paul, the tradesman arrived, looked at what he needed, went to the van and returned to perform the work. The entire transaction, from initial phone call to letting the tradesman out the door, took less than a day. In 2019, this is rare and surprising. 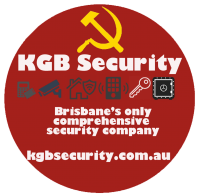 If you need old fashioned professional and personable service with a company that provides excellent tradesman-ship at decent prices than forget the rest and call KGB Security. Thank you Sharon and Paul, impressive work!!! Beeen chasing a particular brand of safe for ages. Nobody had them in stock and could not be bothered getting them in it seemed. Found it on sale @ KGB and decided to buy there and then. Contacted by Allison who was prompt in getting back to me about some minor cosmetic issues with the safe which didn’t worry me at all but she gave me a substantial discount for it which was greatly appreciated. Allison kept me updated through the whole process which was excellent customer service. Safe was delivered today by Wayne and Alex who were friendly blokes and worked to get it where I exactly wanted it. All in all was a great experience buying a product from these guys. Highly recommended and I will certainly tell anyone I know who is in the market for a safe to deal with these guys without question. Thanks KGB. Kelly, Wayne, Gabriel and Alex were extremely helpful, giving me plenty of security advice, tips and tricks - not to mention a great price. Most importantly I'm very appreciative of the time they spent with me making sure my security problems were solved. I would highly recommend their service. We have called upon KGB Security on multiple occasions ranging from Restricted Key Systems, replacing locks, recommendations and supply of suitable padlocks or door hardware. They have also been engaged to do lockouts for us which makes a tense situation easier when you have a professional company in attendance. We have no hesitation in recommending KGB Security and take this opportunity to thank admin staff and field staff for their prompt attention and support. Good group of people with excellent service. The whole team were a pleasure to deal with and the installation crew went above and beyond. I would recommend KGB Security to anyone needing secure storage facilities. Great bunch of guys, fantastic service at a great price. I needed a small part for my safe which they provided in the overnight mail. I highly recommend their services. Thanks guys. Very helpful and friendly service. Thank you Wayne for going above and beyond in the line of duty! So nice that there are still companies which make customer service a priority. Huge kudos. I have been dealing with Kel for 5 yrs and have always had a first rate personalised service. I feel ever grateful for all your help and guidance when I needed it. And going out of your way to make sure my security needs are fully covered. Thanks heaps for your expertise and great service. Excellent service. Actually this is the best locksmith I have been ever. Wayne is pretty nice. Fantastic customer service and light-speed professional work! Thank you Wayne and the team. I would definitely recommend KGB Locksmith & Security to anyone requiring prompt help. Very friendly and quick services, James and Wayne came in and installed our safe no problems. Kel was very helpful & professional with an issue we had with our safe. Thanks again. Thanks for all the help in finding a suitable safe, and having it installed. I really appreciate your professionalism and honest advice. I have used KGB for a number of years. I have been very disappointed recently with their complete lack of service and interest. I can only assume that there has been a change of management. Goodbye KGB Following my disappointment with KGB the staff contacted me and sorted out my issues to my complete satisfaction. Guys were happy and persistent to copy some old car keys from the originals. Difficult job and got there. Thanks. I recently wrote an unflattering review of the service at KGB. I wish now to revise my rating to 5 stars. It was a communication problem that was responsible for the lack of response I initially experienced. Once that was sorted out my requirements were attended to with the usual good service and attention to detail that I have received from KGB over many years. Great service. Helped me move a safe that I purchased at last minute notice. Very professional and knowledgeable would highly recommend to anyone looking at getting a safe transported. Kel's professional advice was very much appreciated. Prompt and efficient service. Very pleasant to deal with. Would highly recommend. Thank you Kel, we are very happy with our purchase. Purchased a new safe and was at a good price. Very heavy duty and was what I was after. Had great service and were knowledgeable on the products. all seem like a really good bunch of people working there. Thank you to Rhiannon for assisting over the phone with as much information as possible and to Paul, the locksmith who attended the property. He was very thorough and knowledgeable and happy to assist with my queries. Very helpful and professional. Dealing with KGB has been amazing and that's why we continue to do business with them. We needed something to be done urgently and Rhiannon made it easy and stress free. She made you feel like your job was at high priority. Great job Rhiannon! When you're leaving for work and hear the click of your door lock behind you and you realise you've left your keys inside is not a good feeling. However, if you live near KGB Rocklea there's no need to worry. Thanks to Rhiannon for being so friendly, accommodating and understanding the urgency of the situation. She sent a technician (Martin) to my home very briefly after our conversation. 5 stars. I highly recommend! Had a last minute need for a call out before an Open House! The booking co-ordinator dealt with my urgency very well, and had a person out the next morning. They arrived on time, and quickly solved the case of the lost keys. Very professional, friendly guys who got the job done in no time. No hesitation in recommending and giving 5 stars. Excellent service. I am not local to the Brisbane area, however Kel was able to send me a replacement lock for my safe and explain how to install it over the phone! Fantastic service - Kel went above and beyond to help me on the same day I called and I will definitely be using KGB in the future. Thanks for the great service! We were able to get the 'how to' guide very easily from the Youtube video. I embarrassingly locked myself out of my house when a door closed whilst I was getting washing in!! I cannot thank Kel and Matt enough for their wonderful service!!!! Very understanding and incredibly efficient. I highly recommend KGB!! Great for safes and securing things but didn't have the blanks for the keys I needed cut. To be fair neither did 3 other locksmiths and they knew where to send me to get what I needed. The whole KGB Team were wonderful, they provided a fast professional service, I highly recommend this company to any individual or business looking for a locksmith. I needed information about an antique fireproof filing cabinet which I need to move. Kel has assisted me greatly with information and tips. Very grateful. KGB helped me out big time! Very friendly staff who showed me lots of great options. Definitely met my needs and it was an all round wonderful experience. My safe would not respond to the combination so I called KGB Security. They sent around a very helpful young man, David, who pulled the door to pieces, fixed the jammed mechanism, restored it to working order and then ensured I understood the combination clearing and setting process. Meanwhile I picked his brains and he chatted happily away providing all sorts of advice on safes. This company (KGB) sticks by their products. Their staff are courteous, knowledgeable and helpful. Highly recommend KGB. We deliver our safes nationwide through Followmont. 24 hr Emergency Locksmith service no. With 28 years of experience with locksmith and security services, we have expanded our safe servicing division to include safe moving, relocation and safe refurbishing.